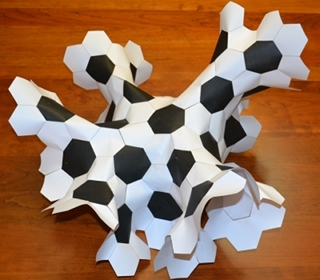 Make a Hyperbolic Football ! We are all familiar with the basic Euclidean geometry of the plane, including the behaviour of parallel lines and angles in triangles. This familiarity may lead us to that it is a law of nature that parallel lines are always the same distance apart and the sum of the angles of a triangle is 180°. The purpose of this activity is to disabuse us of this misconception. Below are materials and directions to build an attractive two-dimensional model of negatively curved (hyperbolic) space (called the hyperbolic football). We also describe an activity to use this model to explore the basic geometry of parallel lines, quadrilaterals, and triangles in the hyperbolic plane. This is an activity that is suitable for a math circle or classroom activity. This has been run at many levels from 5/6 grade on through University Lecturers. Instructions for this activity. A 2-page .pdf document with colour pictures and diagrams. Poster and handout from the 2013 Joint Mathematical Meetings in San Diego, CA. Hyperbolic footballs at University of Ilorin, Nigeria. June 2012. 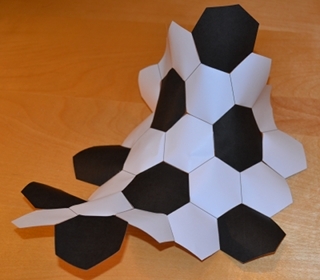 We offer four different paper templates for making your hyperbolic football. For each, you will need to print out templates with hexagons and heptagons. To assemble your models, you will need scissors and tape. It is important to exercise care when cutting and taping; these are precision models. Cut on the lines, not outside or inside of them. Tape the pieces edge-to-edge, carefully lining them up. Each edge may need one or two pieces of tape—do not put tape over the corners (vertices), for these are where the model gets it curvature. Also, tape on the unprinted side; this will make a prettier model. Once one edge is taped, tape the edges adjacent to it. You will have to tease these additional edges apart by 60/7 degrees so that the new edges line up before taping them. The model will not lie flat, anywhere. The hyperbolic football is infinite in extent; you can always keep adding to your model. It is also highly symmetric. Each heptagon is surrounded by seven hexagons, each hexagon is surrounded by three hexagons and three heptagons, which alternate. Each vertex has two hexagons and one heptagon. 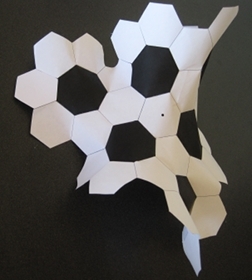 Thus to add to your model, cut out more hexagons and heptagons and simply keep repeating the pattern. This first model was designed by D. Henderson in conjunction with Cabinet Magazine. Here are some on-line instructions. For this, you may want to print out one instruction sheet, and you will need three templates. This is the first model in our gallery. Taping the unprinted side gives a neater model and facilitates the mathematics activity below. Using tape (such as Scotch tape) that can be written on is a good idea. I suggest one improvement to this model. The irregular-shaped pieces each include one distinguished hexagon with a black dot in its center, and the instructions ask you to attach three together on top of each other, forming the center of your model. I recommend cutting this hexagon off two of the three templates and taping the remaining part of the templates to the remaining central hexagon. This has fairly big (3 cm on a side) polygons and can be used to make a fairly big model. It is important to use high-quality paper and be very careful with the taping, for the inherent stresses in a big model can tear the paper. Print out what you need on white paper. I prefer extremely bright and thick paper. You need one copy of the center (HF_Center.pdf) and one or two copies of the side (HF_Side.pdf). Cut only on the dotted lines, and cut out the heptagons. Tape a heptagon in the central hole of the center (HF_Center.pdf); in doing this the hexagonal ring will open up, and there is room for an additional hexagon. Use the one you cut from the hole. The hexagons will form a ring around the heptagon, and on the outside of this ring are several indentations formed by three hexagons. Tape in two heptagons in two of these that are side-by-side. 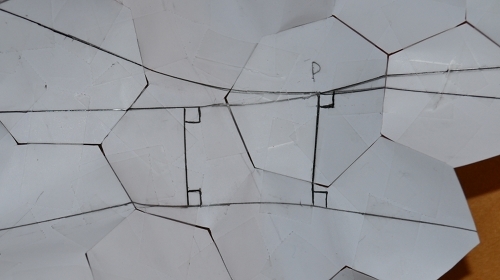 Then the strip of seven hexagons in the side (HF_Side.pdf) may be attached onto them. Your model will be almost symmetrical with three heptagons surrounding a central hexagon and surrounded by a ring of 15 hexagons, with one additional hexagon breaking the symmetry. 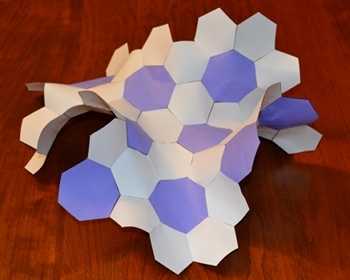 If you wish, you can tape in the five remaining heptagons on the periphery of this model for a complete and slightly asymmetrical piece of hyperbolic paper. 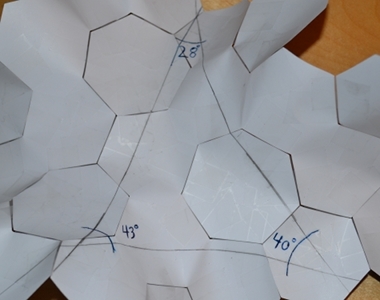 The third sheet contains three patterns of four hexagons each for attaching to these new heptagons, allowing a larger model. This has the biggest polygons, and can be used to make a fairly big model. To make a big model, it is important to use high-quality paper and be very careful with the taping, for the inherent stresses in a big model can tear the paper. Print out what you need on white paper. Three copies of Template A (Hyperbolic_Football_A.pdf) mak an interesting model that is identical to Henderson's model. You must cut on the dotted lines, and the central hexagon should be removed whole (there is a cut to it), as one will be needed at the centre of this model. To add more to your model, print out as many of whichever of the templates as you need. 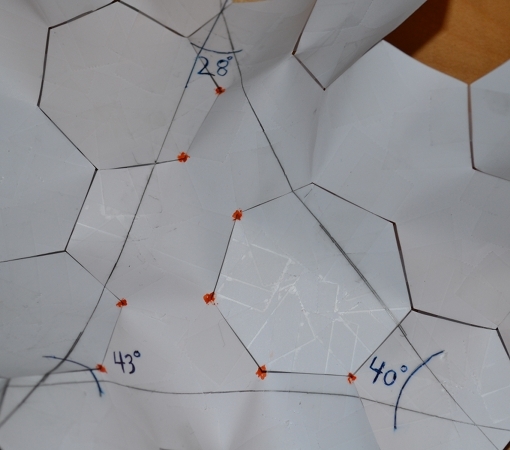 Note that Template C has two extra hexagons that you will want to cut out and use in your model. This model is depicted above with the purple heptagons. Begin with any of the above models, although using a big one is extremely cumbersome. At right is the last model above, from the 2013 Joint Mathematics Meetings. Turn it over and write on the back (the unprinted side). 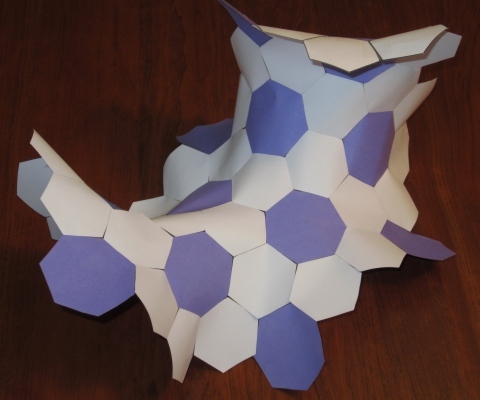 While this model is curved, each polygon is flat (it was cut from a single piece of paper). Also, any two adjacent polygons can be laid flat. To draw a line on the model, flatten part of the model to start the line, and use a short (< 15 cm) straightedge to continue the line across the model, flattening pairs of polygons as needed. Try to avoid running the line through a vertex. After drawing your line completely across the model, you can pick it up, straighten it along the line, and sight down the line to see that it is straight. Viewing it from above, it appears to curve, but that is an illusion as it is drawn on a curved surface. After drawing a first line, pick a point on it and draw a short line segment m perpendicular to it. Then start a new line perpendicular to m and extend this third line across the model. The first and third lines, as they share a common perpendicular m, are parallel. If m is long enough, say nearly the height of a hexagon as at right, then you should be able to notice the interesting feature that the two lines appear to `curve' apart. They do not curve, but the distance between them increases the further they get from the common perpendicular m, which is their only common perpendicular. This divergence is more pronounced for a longer common perpendicular m.
This is easily seen to not hold on the hyperbolic plane. Indeed, on one of the parallel lines from the previous step, choose a point P not lying on the common perpendicular m. Dropping a perpendicular from P to the other line, and then taking a perpendicular to that through P gives a second line through P that is parallel to the original line. The two original parallels and two perpendiculars together form a Lambert Quadrilateral which has three right angles and one acute angle (at P). Now, try to draw a triangle. For this it is best to try to make a big triangle. Once you are done, measure its angles. This is easier said than done, as you cannot fit a protractor on the hyperbolic paper. I prefer to mark off an arc on a small sector of a circle (cut out of a scrap of paper), lay the semicircle on a flat surface, and then use my protractor. However you do it, you should find that the angles have a sum that is less than 180°. For example, in the triangle at right, that the sum is less than 180° is visually immediate. In fact, the angles were measured to be 43°, 40°, and 28°, for an angle sum of 111°, plus-or-minus some measurement error. It is possible to use an analog measurement of the sum. Simply mark off three consecutive arcs along a small sector of a circle, then the sum should be apparently less than 180°. This is nice to do in a group, for different participants will make different triangles, and you can discuss the different angle sums that they get. We explain what is the meaning of the angle sum (and also what is the acute angle in our Lambert quadrilateral above). If you have really careful participants, this can be a fascinating discovery activity. = 120° + 120° + (180°-360/7°) = 360° + 60/7°. Thus there is an excess of 60/7°, which is about 8.6°. By convention, we say that the curvature at each vertex is -8.6°, which we consider to be a δ function, as the curvature everywhere else is zero. Thus the integral of the curvature over a region is -8.6N°, where N is the number of vertices in that region. There are 8 vertices in our triangle, so the integral of the curvature over the triangle is 8 times -8.6°, which is about -68.6°, and is almost exactly the deviation of our angle sum (111°) from the Euclidean triangle angle sum of 180°. This is of course not a coincidence, but an example of the general theorem. This has several consequences. First, our Lambert quadrilateral has acute angle (90-60/7)°, which is about 81.4°. Far more fascinating, which you can see on a large model, is that a triangle cannot contain 21 or more vertices (3 heptagons).